Widely credited as a venture capital and private equity trailblazer, Edgar "Ned" Heizer Jr. '51 made a lot of money over a career spanning decades. Yet when he died Dec. 3, Heizer, 80, was remembered by family, friends and business associates as a man primarily concerned with creating companies of enduring value. His deals included Federal Express, International House of Pancakes and Amdahl Corp., a high-tech venture that grew into a multibillion-dollar business. Heizer also served his industry and educated others — including lawmakers — about the importance of private equity to the American economy. He helped found the National Venture Capital Association and worked to gain passage of legislation in 1980 that reduced hurdles to participation in the industry. "What a perfect person to be the donor and namesake for the Kellogg School's Private Equity and Venture Capital Center," says Mitchell Petersen, the Glen Vasel Professor of Finance and the center's director. Originally endowed in 1988 with a gift from Heizer and his wife, Molly, the Heizer Center for Private Equity and Venture Capital supports an abundance of research, experiential learning and educational opportunities, including guest speakers, seminars and conferences. Now the center will also handle the logistics associated with these and other initiatives — a responsibility formerly held by students. As a result, students will have more time to focus on more valuable aspects of their education. "This important structural change unleashes the students' creative power," Petersen says. "The center, for its part, then serves as the 'institutional memory' — the archive for the school's private equity and venture capital offerings, providing ongoing continuity." The center will also work to reconnect Kellogg and alumni working in the finance field. When graduates contact the school seeking ways to contribute, the Heizer Center can direct them to opportunities that best meet the school's needs and satisfy their interests and expertise. Such connections may result in philanthropic contributions or curriculum and program enhancements, says Petersen, and may also bolster the recruitment of Kellogg graduates. "We're trying to build a foundation for all kinds of industry knowledge and to create win-wins for our students, alums and others in the finance world," Petersen says. The center is an apt manifestation of Heizer's passion for research and education. "He was a very smart guy with varied interests, and he liked people," says his son Skip Heizer, who noted his father's numerous academic credentials: bachelor's degrees in chemical engineering and business from Northwestern University, a law degree from Yale and a CPA. Not surprisingly, Heizer tended to research his investments thoroughly. "Once he made a commitment to a company, he was in," Skip says. "He genuinely wanted the entrepreneurs to succeed, and he played through on almost everything he did." "Ned was probably the best analytical business thinker I ever met," adds Charlie Palmer '65, president and partner of North American Co. and a longtime friend who helped start Heizer Corporation. "He would get all the facts before applying business judgment." 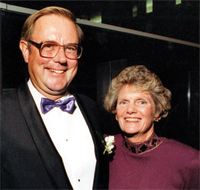 Judy Dorr, former Heizer Corporation CFO, recalled Heizer as a "down-to-earth guy" who excelled at bringing talented people together and then trusting them to get the job done. "At Heizer, you really felt like you were part of a team," says Dorr, who today is CFO at Draper Fisher Jurvetson Portage. "We were laying the path for a lot of venture companies to come." In recognition of Heizer's "profound and lasting contributions" to private equity, the Illinois Venture Capital Association bestowed its Stanley C. Golder Award on the Kellogg alum in 2004. Maura O'Hara '96, the association's executive director, describes Heizer as an optimistic innovator who transformed his industry, lobbying to allow institutional investors to participate in private equity. In particular, she cites his efforts to advance the Small Business Investment Incentive Act of 1980, which paved the way for private equity firms to go public. "Before Ned Heizer, that was impossible," O'Hara says. "He totally moved the agenda on this."